Where there's a media platform popular with consumers, advertisers are never far behind. Case in point, Amazon's digital assistant, Alexa, which has made its way into everything from smartphones to fridges since launching inside a wireless speaker back in 2014. VoiceLabs, a chunderifically self-described "Voice Experience Analytics" company, is hoping to cash-in on Amazon's success by inserting "6-15 seconds long" advertisements "at the start and end of conversations." This, the company hopes, "can naturally lead a consumer into an experience," which is a polite way of saying "we will make you buy all the things." VoiceLabs' plans to place audio ads inside Skills—third-party apps created by developers that allow Alexa to do things like book an Uber or turn on some smart lights—stand in stark contrast to Amazon's developer agreement, which restricts "any advertising for third-party products or services." The only Skills that are officially able to feature any form of advertising are streaming music, radio, and flash briefings. In an interview with Cnet, VoiceLabs' CEO Adam Marchick maintained that it is currently "100 percent in compliance with Amazon's policies," by sticking to advertisements in streaming audio and flash briefings. However, the CEO also offered up a theoretical example of a developer creating a sports trivia skill, which could then offer advertisements from ESPN, one of the company's launch partners. Fast food vendor Wendy’s is also on board at launch, with Skills developers Federated Media, XAPPmedia, TWiT.tv, and Appbly signed up to insert advertisements into their apps. One long advertisement could theoretically be split up into smaller parts, which "tell a brand story over the course of multiple user sessions," according to VoiceLabs' Alex Linares. However, the company is promising that consumers will at least be spared repeated advertisements, with time frames such as "once every 15 sessions" being touted. Sponsored messages will also be "clearly marked as advertising," although it's not clear how they will be de-marked. Ars has contacted Amazon for comment on VoiceLabs' plans. 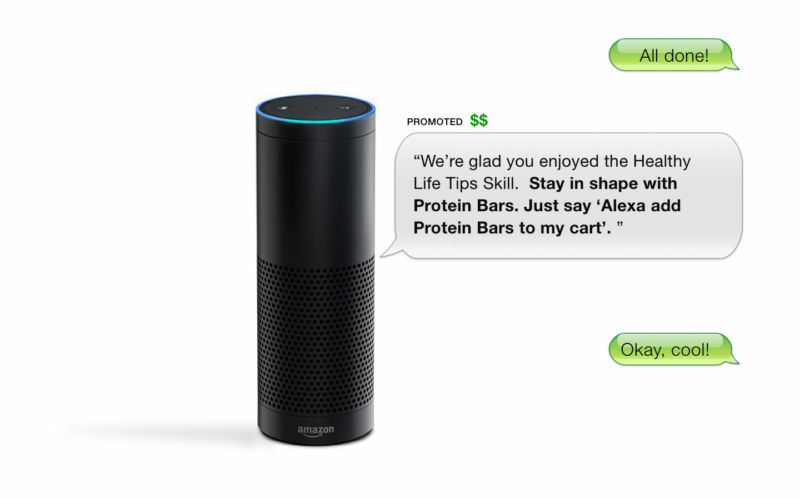 In an earlier interview with TechCrunch, Marchick claimed that Amazon was collaborating with VoiceLabs on the development of sponsored messages. But what about the devs? While it's extremely unlikely that Alexa users will welcome any advertising intrusions, there is an upside for independent developers. Many were angry when Amazon placed restrictions on ads within Skills, claiming that without advertising income there was no way for them to invest time into further development. Indeed, with a few notable exceptions from large companies, most Alexa Skills are of questionable utility, to say the least. By reintroducing advertising income, VoiceLabs hopes to create a more robust ecosystem. If Amazon is backing sponsored messages as Marchick claims, it would be an odd move. Amazon has its own advertising platform and payments platform, both of which could be leveraged in order to fund Skills development. At the very least, introducing charges for Skills—currently all are free of charge—would help the company garner backing from cash-strapped developers. Then again, if you try out a few Skills, you'll find that some devs are openly breaking Amazon's advertising ban. "With 10,000 Skills, how are you going to tell if someone starts advertising?" developer Joseph Jaquinta asked TechCrunch in April. "I'm not seriously affected by the change in advertising policy. I had advertising in my Skills before they even had a policy. And I've been in violation of their policy from the first day they introduced it. But they have zero enforcement and have never asked me about it."